Eskew+Dumez+Ripple designed the revamp of a fine Art Deco building in the old Warehouse District of New Orleans. They also added a 4-storey extension and the end result is a new boutique hotel. 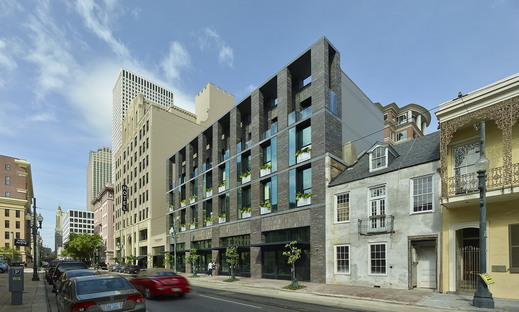 There’s a new hotel in New Orleans that shows us how well historical buildings can be adjusted to meet new, changing needs. The Ace Hotel project by studio Eskew+Dumez+Ripple is on a corner lot in the city’s Warehouse District just south of the famous French Quarter. The original, 9-storey building circa 1928 was designed by Weiss, Dreyfous and Seiferth, architects of the Louisiana State Capitol in Baton Rouge, and was once the home of the largest furniture store in the Southern states of America. Eskew+Dumez+Ripple had a double brief: to restore the existing Art Deco building and to expand the area to 17,000 square metres with a 4-storey addition to meet the client’s needs. This accommodates a 234-room boutique hotel with bar, restaurant, conference rooms and retail and even has its own music venue. All of this without altering the street front and in harmony with the urban context, preserving and recreating the unmistakable atmosphere of the past, where an eclectic collection of materials and decor used in the interiors of each hotel room pays tribute to the city’s unique culture and history. The Eskew+Dumez+Ripple team of architects also removed the fixed aluminium storefront windows that drastically changed the entryway in a 1970s renovation. They restored the entryway and connected the newly constructed building to the existing structure by a minimal glass bridge. This is set back from the street to preserve the historical one-level garage that is now home to a coffee shop. The new build gives the Ace Hotel extra rooms and has been designed as a contemporary homage to the adjacent Art Deco character in a quiet, elegant reinterpretation of its classic neighbour. The new building’s solid base and complex structure play off the pattern of the existing building’s façade, complementing the original structure but not competing with it. The deep recesses of the top floor balconies are a contemporary response to the punched openings of the existing structure. In addition to the new building, Eskew+Dumez+Ripple also upgraded the core with additional structural bracing, new lift and new stairwell in the centre of the original building to provide safety and to support the rooftop pool and garden. The original building’s vestibule and ground floor, formerly used as office areas, have been repurposed as the main lobby and signature restaurant. The interiors feature restrained finishes and in the lobby especially elements of the existing building are weaved subtly into the hotel’s branding, with gentle nods to the city. These existing elements are complemented by custom solid wood panelling and trim that round out the elegant, vintage character of all the hotel’s interior for an experience marked by a warm and friendly atmosphere.